How Do We Make New Makers? How do we make new make new makers? Recent experience shows that when kids are exposed to the context for making, they pretty much handle the job themselves. We just need to get out of the way. The challenge to us adults is, providing that context, and being brave enough to get out of the way. Enter Maker Education Day. Every year before Maker Faire, a group of school kids gets exposed to just what it means to be a maker. We’re not teaching them. We’re exposing them. Perhaps infecting them might even by the right term. Because once they see the amazing stuff other makers are doing, they catch it: The desire to make. The next bit is crucial. Give them a chance to see the makers in themselves. Let them play. Hand them tools. Ask them to try. Then watch them light up, and get out of the way. Because out of that group of kids, you can bet some new makers were born. 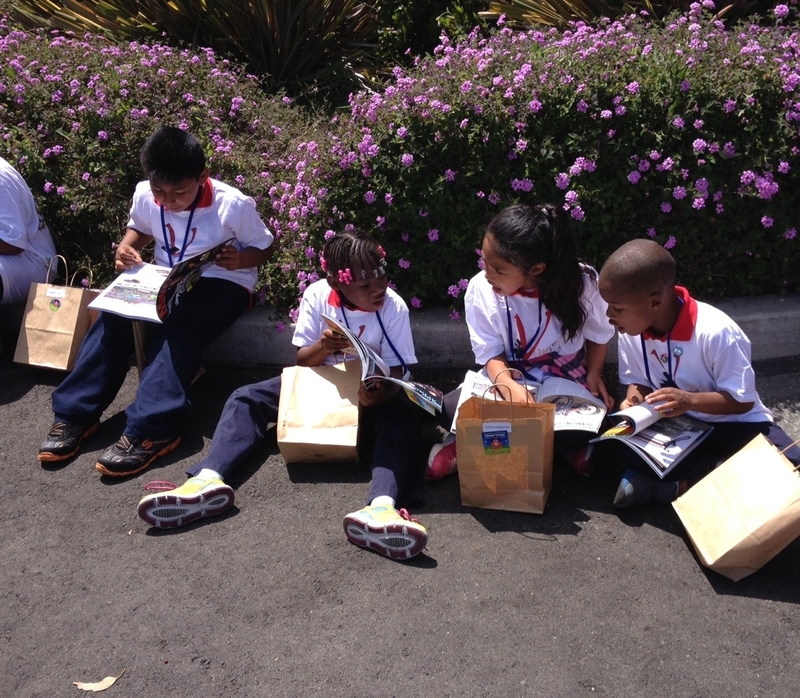 This year’s Bay Area Maker Education Day was sponsored by Intel. 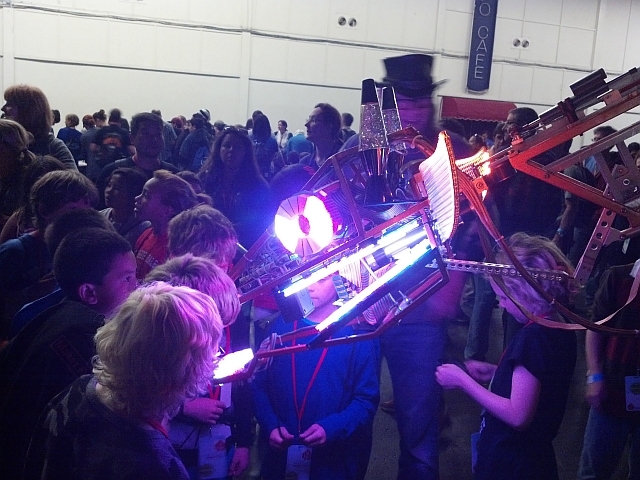 More than two thousand kids from 65 schools and home school groups came to learn about making. 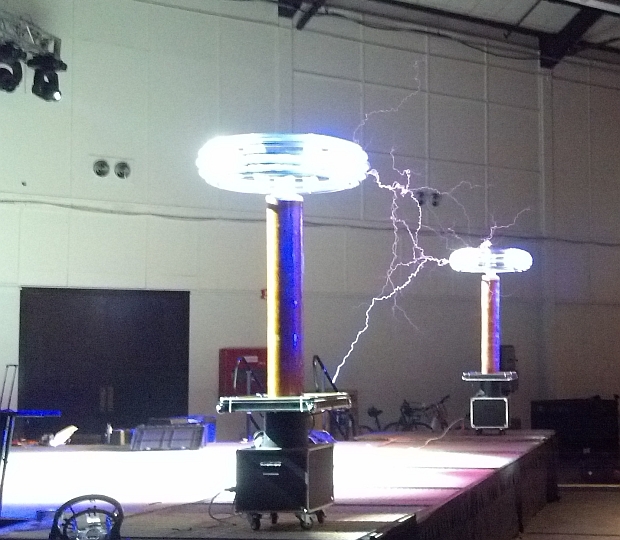 The event kicked off with an incredible demonstration of electrical power by Arc Attack, a group that uses high voltage Tesla coils to blow fuses, crush soda cans, and play music. Oh, and generate giant bolts of lightning. It’s not a demonstration that kids, or anyone else who sees it, will soon forget. It doesn’t come with instructions, but there’s more than enough inspiration there to make encourage a curious mind. Another Maker Faire favorite in evidence at Education Day was Russell the electric giraffe, a creation of artist Lindsy Lawlor. Russell is 17 feet tall, covered in lights, and can roll and walk. Kids touched, petted, laughed and were generally charmed by this gentle giant. Charmed by a gentle giant. That’s just the beginning. Interesting, creative, intriguing, colorful, inspiring and wonderful examples are there for the kids to explore. Many of the exhibits are interactive, or even invite kids to create something themselves. There were robots, movable sculptures, crafts, and more. That takes care of providing the context and setting an example for the kids, but what about the tough part? How do we help parents and educators build more supportive environments and learn to make makers? Education Day has something for the grown-ups too. Hosted inside a hanger bay sized building made up as a makerspace was a three hour reception for teachers and other educators. Sponsors like Epilog Laser, Invenscience, Midwest Technology, Parallax Inc., ShopBot, SketchUp and Tormach helped make this model makerspace possible. Many of them were there to talk to teachers and parents who came to find out how they could help make makers. Groups like the Bay Area Resource Area For Teaching (RAFT) and the Community Science Workshop Network were on hand show educators how fun crafts can be used to inspire and teach. One family included Julian, Yvonne, and their son Aiken. Julian is an associate professor of journalism and media studies. Yvonne is the director of a new media production lab at her high school. Both were looking for new ways to inspire children to learn. Aiken was investigating a new programmable LED kit from GigaByte, as co-founder Michael Duong guided him through the graphic programming interface to create his very own light patterns. Aiken programs a wearable LED box. There was also a press conference for the Maker Education Initiative. Executive Director Paloma Garcia-Lopez addressed a crowd of sponsors, educators and press and explained their mission: to engage more children in making, and provide resources for libraries, schools, science centers and makers themselves. “Making seems to reach kids,” Dale Dougherty shared. He observed that, “Maker Faire is getting younger every year, and yet we don’t find wide spread making in schools, clubs and homes.” This is something the Maker Education Initiative intends to change. Dale is on Maker Ed’s Board of Directors, along with Mark Greenlaw, former CIO at Cognizant. 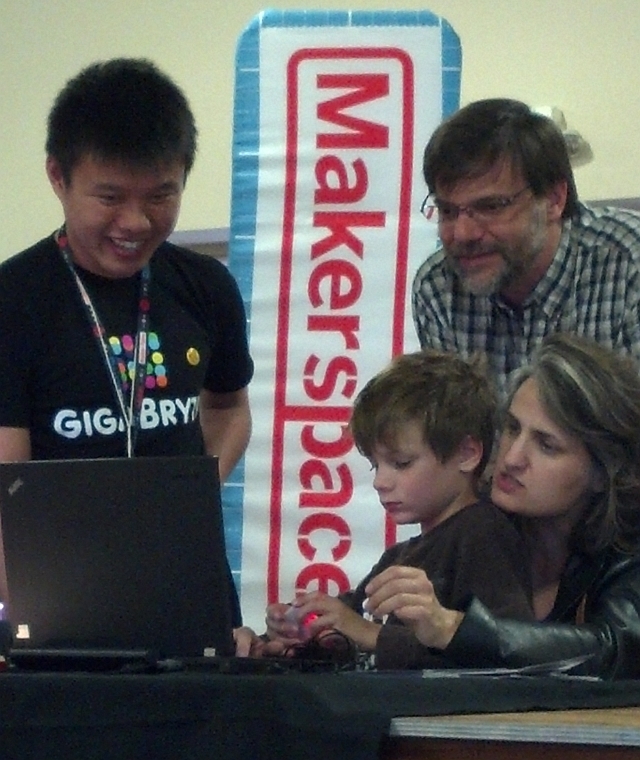 “The maker movement is working to close the achievement gap,” Mark said. John Lyman from Google for Entrepreneurs was also in attendance. “Today’s makers are going to be tomorrow’s entrepreneurs,” John said. He discussed how Google was already supporting the maker community through Google Hangouts to connect makers and Maker Camp, build communities of entrepreneurs, and equip makers with skills for success. All in all, Maker Education Day was an outstanding event, bringing together kids, makers, industry leaders, parents, and educators. I think everyone learned a little something.